Reflecting a combination of chic, and contemporary architecture, with its sophisticated interior décor, the five star Baystone Boutique Hotel & Spa brings you all the comfort and relaxation for a perfect holiday destination in an absolutely luxurious and classy environment. The hotel contains two different blocks. The main block includes a restaurant, swimming pool, spa, and suites. 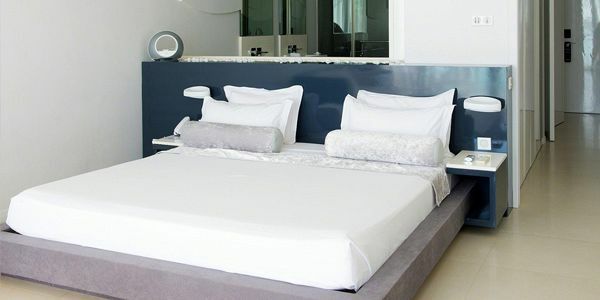 Block B is approximately 30 meters from the beach and features the deluxe rooms. Here, you will get to contemplate the stunning beauty of the azure crystal clear lagoon of the north west of Mauritius. 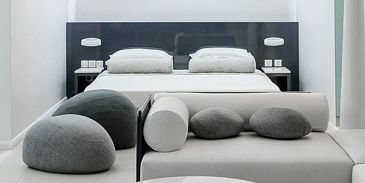 Baystone Boutique Hotel & Spa is equipped with rooms and bright suites which are modernly done and uniquely designed with tailor-made furniture. The hotel accommodation is comfortable, spacious, and luminous, reflecting modern architecture, specially designed by Albert Angel. Some of the room amenities feature air conditioning, mini bar, complimentary Wi-Fi connection, KORRES bio products, King Size bed with TEMPUR linen, some offer jacuzzi, rain shower, and Chromo therapy bathtub. You can relax and chill at the terrace or balcony in some suites where you will get the chance to have a fantastic view of the incredible lagoon. 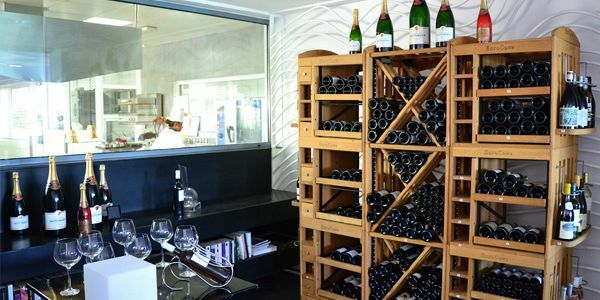 Baystone Boutique Hotel & Spa provides a refined and local cuisine. You will have the chance to relish the delightful dishes featuring local cuisine with the hotel's restaurant. It offers a card menu for a varied breakfast as well as lunch and dinner. Enjoy the private beach area and water sports facilities like snorkelling, kayak, laser boat and the land activities to add some fun during your stay! 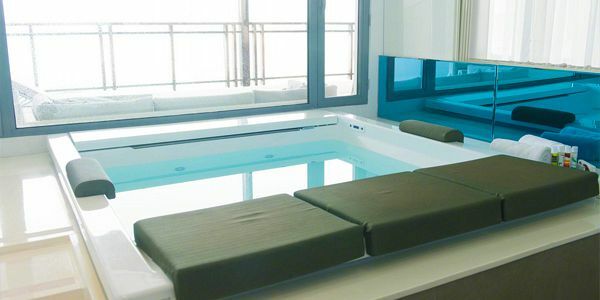 In addition to its customized service, the 'Spa with its unique floatation room is ideal for a moment of deep relaxation. A haven of peace, calm and quiet, offering a path to serenity. 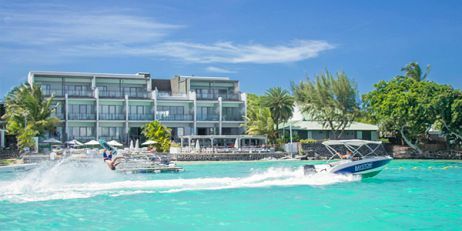 Located in Grand Bay (Pointe aux Canonniers), Baystone Boutique Hotel & Spa is minutes from Blue Water Diving Centre and Canonnier Beach. 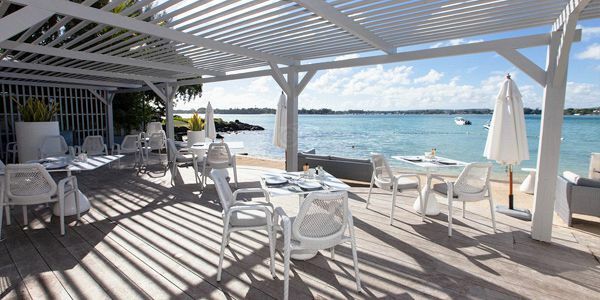 This 5-star hotel is within close proximity of Mont Choisy Beach and Merville Beach. The boutique hotel offers elegant and sophisticated accommodation, featuring 21 bright rooms and suites which are in a perfect harmony with the hotel's modern style, and refined design. 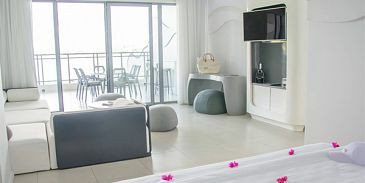 The air-conditioned rooms feature mini bars, flat screen televisions, complimentary wireless internet access, tempur-pedic bed, and single sofa beds. Some rooms have private furnished balconies where you get to savour a relaxing time. There are also private bathrooms with separate bathtubs. The chic and sophisticated deluxe rooms are located in building B, overlooking the small coastal road of Pointe aux Canonniers, some 30 metres from the hotel's beach. 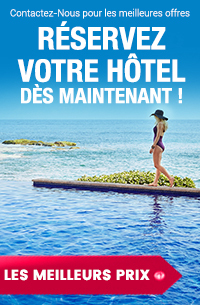 The chic and sophisticated Deluxe Rooms are located in building B on the 1st and 2nd floor, overlooking the small coastal road of Pointe aux Canonniers, some 30 metres from the hotel's beach. The exquisite Junior suites are located either on the ground or first floor in the main building. 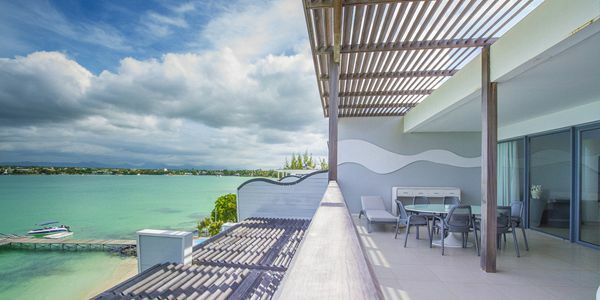 They feature a furnished balcony where you can enjoy the gorgeous sea view. Set in a very chic and contemporary design, the spacious senior suites offer striking turquoise lagoon. These suites are located in the main building on the 2nd floor. The very sophisticated and elegant Baystone suite is located in the main building, offering incredible sea view. 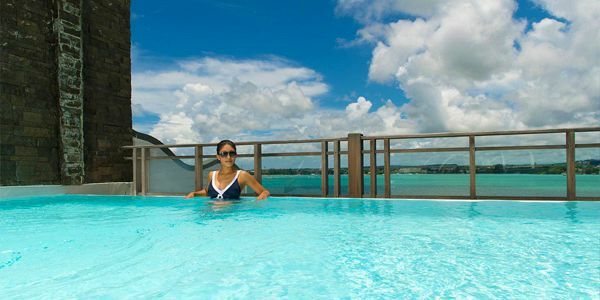 Enjoy an exclusive access to the unique roof top swimming pool, and chill at the fully equipped terrace and balcony. Enjoy your stay with the various activities and facilities provided by the boutique hotel. Relax at the full-service spa, where you can enjoy massages, body treatments, and facials. You're sure to appreciate the recreational amenities, including an outdoor pool, a steam room, and a seasonal outdoor pool. Additional features include complimentary wireless Internet access, concierge services, and babysitting/childcare (surcharge). Guests can catch a ride to the beach or shopping on the complimentary shuttle. Operated by an expert team, the Spa proposes to its clients a hammam, four beauty parlours, one of which is reserved for massage for couples and the others for beauty treatment, a hairdressing salon and a float cabin, an exclusivity in Mauritius. Relaxation and skin exfoliation with dark soap and a horsehair glove during a Turkish bath session. Discover all the benefits of the hammam and let yourself be tempted by a moment of complete relaxation. Floating is the best way ever for men to experience deep, total rest. In the 36°C warm water, bathed in soft light and relaxing music, one hour in the float room is equivalent to 4 hours' sleep. In addition, the benefits of floating build up: the more time you float, the better it is. Floating, which allows you to totally relax yourself physically and mentally and recharge your batteries, is ideal after a jet lag or a period of stress. It also helps you improve your concentration and creativity. Relish the delightful dishes at the Baystone Restaurant featuring local cuisines. The restaurant provides a card menu for a varied breakfast as well as for lunch, characterised by summer flavours. In order to delight your taste buds, a wide variety of sweets is also proposed for tea time. As for dinner, the Chef's Table d'hôte has pride of place, offering a sophisticated menu, yet allowing for alternatives according to your wishes. From Monday to Saturday, the Chef concocts a daily special according to the seasons. The Brunch offered everyday combines sweet and salty savours. From Monday to Friday, as well as on Saturdays and Sundays before noon, after having relaxed yourself in our SPA, extend the pleasure and join us for lunch in front of the lagoon. We also offer, by reservation, a gastronomic menu focused on the lobster. Every night, our restaurant welcomes you for a high quality dinner combining the influences of the Mauritian and French cuisines.